I love a birthday month, not least because it is guaranteed to see lovely things creep into my kitchen. 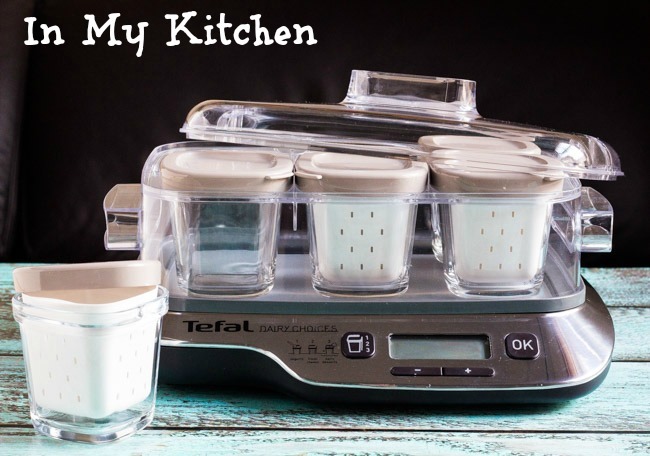 I had been coveting the Tefal Dairy Choices since I first discovered it. It’s three settings make yoghurt, fresh cheeses and desserts, although so far I have only used the yoghurt setting. I have been making flavoured yoghurt by placing a tablespoon of jam in the bottom of the pots, then adding the soon-to-be yoghurt. The jam flavours the yoghurt during the setting process, and we have been enjoying these little pots for dessert. Mini steam puddings are next on the list to try, however fresh cheeses will require more research as the details that accompany the machine are too vague for my liking. The other shiny new appliance In My Kitchen at the moment is a pie maker. Friends raved about these last year, but as I didn’t start searching for one myself until the end of winter they were completely sold out. I stumbled across new stock whilst recently shopping with my mother-in-law, and she kindly bought me one for my birthday. This will be put to good use in the winter months, so I am starting to make fillings in anticipation. Any ideas would be appreciated. 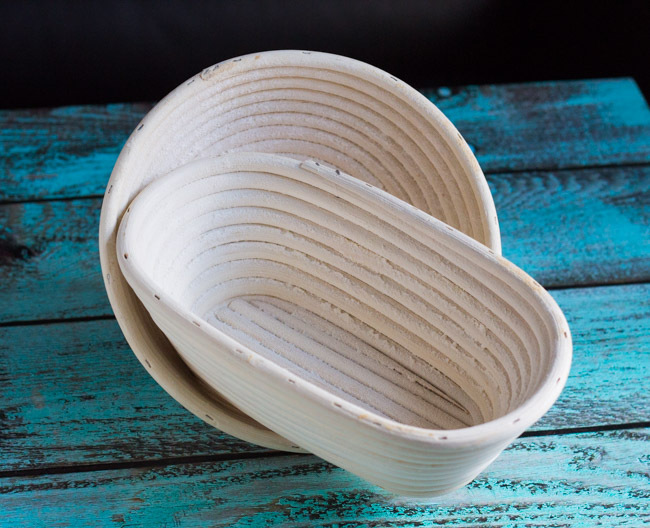 I have long struggled with shaping my loaves, and have been wanting bannetons for ages. Mr Grumpy showed that he does listen to me (sometimes) and bought me two small ones to experiment with. I have been having lots of issues with my starter of late, and my bread has suffered. However I was given a new starter last week, and between it and the bannetons I have just produced one of my best loaves ever. No pictures though, as we ate it rather quickly. 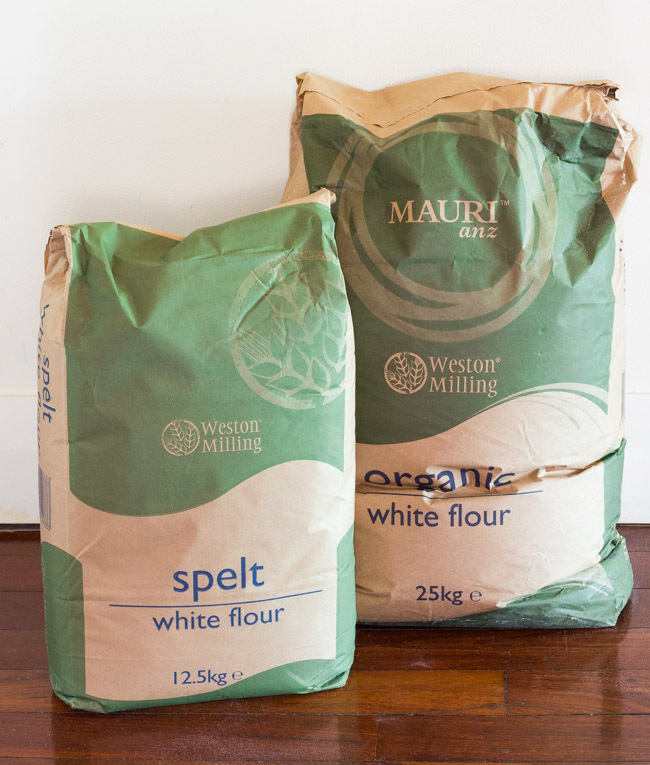 There are two large sacks of flour (25kg of wheat and 12kg of spelt) taking up prime real estate on my kitchen floor at the moment. I don’t bake much during summer, so can survive on small bags of flour from the shops. Now that the cooler weather has finally arrived, the smaller bags will no longer cut it. All I need to do is find somewhere to store them. 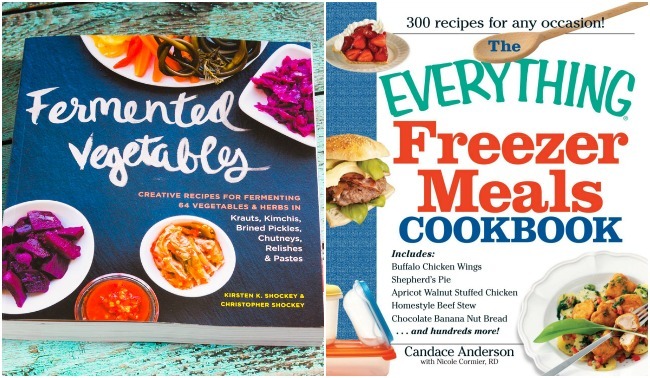 There are two new books In My Kitchen this month. Celia gave me a heads up about the Fermented Vegetables book when it was on sale on Kindle a few months ago. It has fermentation recipes for almost every vegetable, so is a great resource for using up those gluts that invariably happen when you grow your own. I liked the Kindle version so much, and found it so useful, that I bought the hard copy. I am still investigating the wide world of freezer cooking, and with my latest purchase of The Everything Freezer Meals Cookbook on Kindle I might now have enough resources to actually start putting some menus together. Watch this space. Short and sweet this month. Head on over to Celia’s at Fig Jam and Lime Cordial to see what is happening in other kitchens around the world. Oh nice! I'll be interested to see your thoughts on the Tefal appliance! I have not heard of those, but they sound like a useful addition to the kitchen. I am liking it so far Liz but I think I might need to buy more pots so I can keep yoghurts in the fridge and makes desserts and fresh cheese when I like. Each pot has a little strainer basket as well so I have been making small amounts of labne, which work well for individual snack dips. It is proving very useful. Steamed pudding for dessert is a bonus;) I love the sound of the spinach and ricotta pies. Must give those a go. Thanks. Thank you for inviting me into your kitchen this month too Tania! Love your pie maker, bread bannetons and always wondered whether the yogurt machine would work! Thanks for dropping by Joanne. The yoghurt machine works really well. The family like the yoghurt better from this machine than the larger machine I have. Homemade yogurt is really easy to make Kavey, and much cheaper than buying it. I can make a litre of organic yoghurt for less than 500g would cost me in the shops. I have a post in the archives for making it from scratch if you want to try it. Potato and cheese are one of my all time favourite pie fillings. Oh and ham hock with leek. I'd love to hear how you get on with that pie maker, never seen such thing. Yum, love the sound of those Ania. Will add them to the list. I have only used the pie maker once but it was so easy. I am looking forward to using it more. Thanks Beck. I am loving the bannetons. I can highly recommend them. 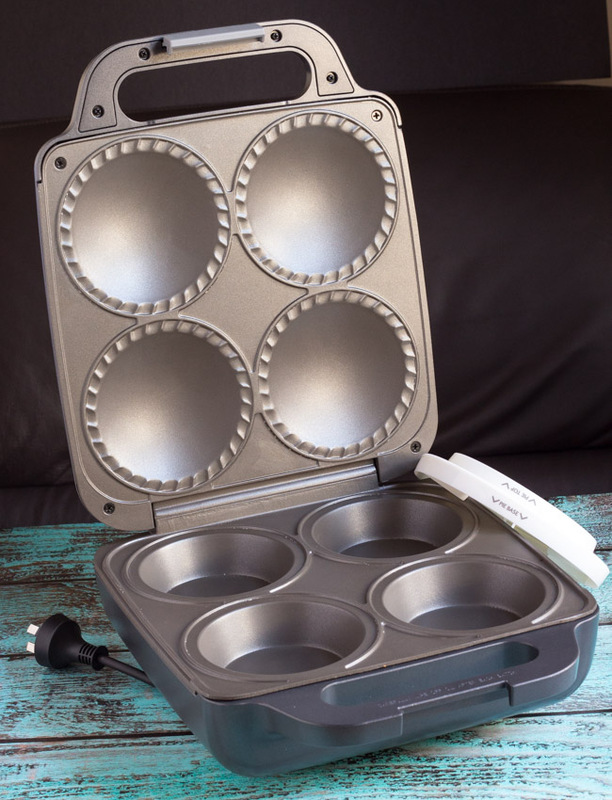 I've never seen a pie maker before, nice gadget! Wonderful to see what is new in your kitchen. Love the yogurt/cheese maker. It's going to come in very handy this winter Liz. Thanks for stopping by. The pie maker is fast turning into my favourite gadget Sherry. Yoghurt is so very easy to make, I never buy it anymore. I took your advice and made chicken & mushroom pies. They were very good. Thanks. The husband is not happy about the flour sitting on the kitchen floor but I cannot find a more accessible place to store it, so there it stays :) I cannot believe I have more flour than you . Wohoo!